Prime location for this fully furnished, ground floor 3-bedroom, 3-bath penthouse unit that offers the beach as your backyard! All 3 bedrooms are Gulf front which is extremely rare! Enjoy not one, but two, covered patios with easy access to the pool area and beach boardwalk. This beachfront unit is a great turn-key opportunity and includes two assigned parking spaces in the garage. Fully furnished with charming beach decor and located in the heart of Destin, you'll have no problem keeping this rented throughout the year. 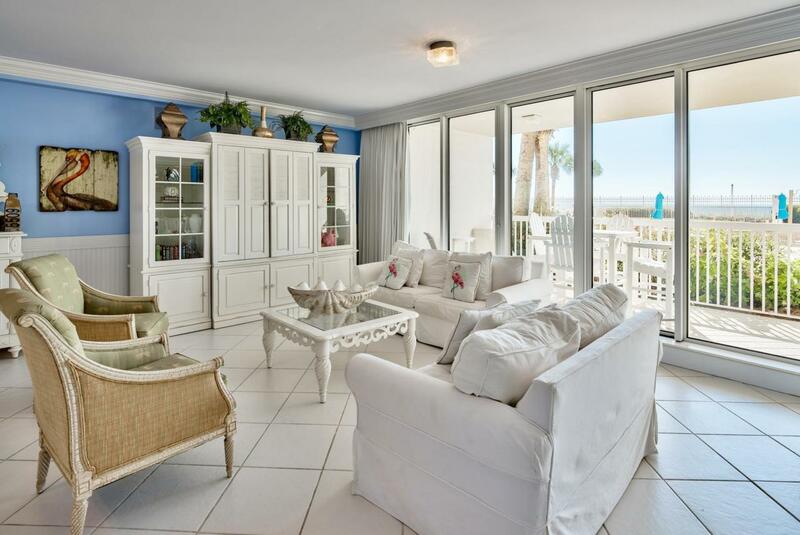 Crown molding, tile floors and wainscoting throughout accent the beach style. The unit is light and bright with floor to ceiling glass doors and windows bringing the Gulf views in. The open floor plan is great for entertaining with a spacious living & dining area.You can access one of the patios directly from the living area and the other from the bedrooms. The kitchen offers ample cabinets and countertop space, a breakfast bar - great for causal dining, and white appliances. The Gulf front master bedroom features direct patio access, a large walk-in closet, an en-suite bathroom with dual vanities, a whirlpool tub and tiled walk-in shower. The middle bedroom, also gulf front with patio access, has it's own en-suite bath as well. The gulf front 3rd bedroom has a full size bed and a bunk bed to sleep more guests. The bathroom for this room is just across the hallway. Each patio opens to the beach front pool deck, so you are merely steps away from the 2 seasonally heated pools, 2 hot tubs, and of course the beach! Silver Beach Towers has over 600 feet of dedicated beach frontage for you to enjoy. This is a phenomenal opportunity to own a solid rental investment property or a full time beach front residence. Building amenities include two Gulf front 6,000 sq. ft. seasonally heated pools with waterfall fountains, two hot tubs, large pool deck, over 600 feet of beautiful Gulf front beach, grilling area, and an elegant 2 story lobby with Gulf views to welcome you to Silver Beach Towers. The unit includes two reserved parking spaces, with additional overflow parking in the parking deck. Silver Beach Towers is located in the heart of Destin, the world's luckiest fishing village. You will be close to all the fine dining, shopping and entertainment options the area is famous for. Local attractionos include Big Kahunas water park, and The Track amusement park with go-karts, bumper boats, mini-golf, and arcade. Between the beautiful emerald waters and pristine beaches of the gulf, and all the entertainment, outdoor activities, shopping, and dining... Silver Beach Towers offers the very best of the Florida beach life.